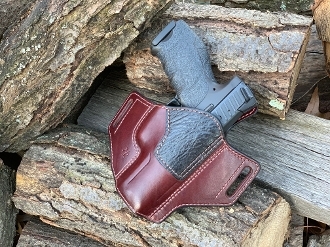 HK VP9 Osprey OWB holster. Right handed, 1.5" belt slots. 15º forward rake. Cordovan cowhide with matching cordovan full grain leather lining. Black shark reinforcement panel. Full rear slide coverage sweat/body shield. Brown stitching.